I just wanted to post a very quick, short update on Ailee and her lambs. For those new to this year's lambing, Ailee (one of our ewes and fleece producer par excellence), could not deliver her lambs normally and was rushed into the vet's office a week ago for an emergency c-section delivery of two beautiful ewe lambs. Due to the drugs and stress she had undergone, Ailee was taking care and nursing only one of the lambs. I had taken over and was bottle feeding the other girl as Ailee kept pushing her away. I named her "Sugar", for the sweet little girl she is. I had been feeding Sugar until about three days ago. It seemed when I showed up with the bottle, Sugar was more intent on just wanting to be with me as well as sucking on the seams of my jeans. I had a sneaking suspicion as to why but it wasn't confirmed until today. Ailee has indeed taken over mothering Sugar as well as continuing on with her other daughter's care! It seems all she needed was some time and space as well as a round of pain meds and care. Today we saw Ailee actually nursing both girls at the same time, one on each side. I feel relieved. Sugar is getting the care she needs from her own mother. I don't mind being a substitute, but this wee lassie needs to grow up with sheep and learn all things "sheepy". While part of me would have loved to bring her in the house (diapers, please) and have a "house lamb", I know, deep in my heart, that our house is not where she's meant to be. That said, she still stays very close to me when she's out in the pasture. Or she'll run with her sister and the other lambs...but as soon as she's tired she's right at my side...still my shadow. Thank you all for your kind words, suggestions, and encouragement as we have dealt with this situation. It has not only helped me, but also Ailee. I see her getting stronger each day and more of the mother ewe I know she can be. The only sad thing is that Ailee will have to find a spinner's flock to live in instead of a breeder's flock. And these two beautiful ewe lambs will be her last babies. Last Wednesday, lambing began here at Sheep Thrills Farm. While not totally a surprise, from the size of all the ewes we had suspected they might "pop" well before last Wednesday. It became apparent the girls were having twins at the very least with all of them being very "wide loads" as they ambled around the pasture. 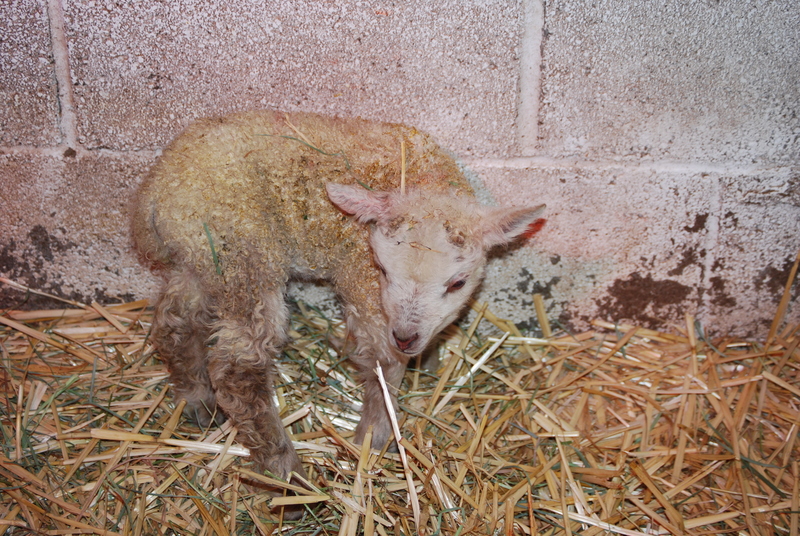 Lacey lambed first on Wednesday morning. She always seems to be the first ewe to lamb - which makes me wonder about her outward composed behavior. I think I know who our "Flock Floozy" is. ;-) Out first was a beautiful little spotted girl, then a handsome young lad made his appearance right on her heels. Beautiful twin lambs. The little girl is a spotted gray and her brother has some color (browns) to his legs. Amanda, being know for the huge boys she normally has, kept wanting scratches and brisket rubs as her time approached. I would whisper in her ear, "No boys this time, Amanda. No two big boys...I want three little girls, please." Amanda must have been listening to me. My friend, Melanie, being a nurse and interested in all things medical (and a godsend with all the help she gave), came to witness the births and assist me by handing me necessary items I needed to help the moms and clean up the babies. While we watched Amanda having more intense, but unproductive, contractions, Mel asked what that was hanging out Amanda's bum. It was a tail! I gloved up and went in - and found a lamb's rear-end where a head should be! I tried working my way down to find legs to correct the lamb's position, but there was no room at all in there. After trying to find the other back leg without success I decided to get a good purchase on the hipbones of the lamb and pull along wit Amanda's contractions. Out popped a beautiful brown and white spotted lamb. And it was a girl! No sooner did the one lamb get out and breathing when another lamb was sliding out of Amanda right next to her sister -- another girl!! While Amanda was frantically trying to clean up the twins, I heard a groan and looked to see another lamb hanging out of Amanda's backside. I thought "My gosh! What's she got in there, a litter?" As a matter of fact, she had three girls in there! Yes, Amanda have me three beautiful little girls...just like I asked her. :) Good girl, Amanda! After Amanda's triple-play I thought I was done for that day. Mel went home late in the afternoon leaving me word that if either of the two remaining ewes lambed to please call her. OK. I'll keep an eye on them in the monitor in the office. I checked about 9 p.m. to find Loretta digging furiously trying to make a nest for herself. "Don't tell me she's going to have her lambs now!" I thought, promising myself to check on her later. So, I stayed up checking Loretta at 10, then watched TV for a bit, heading back to the monitor at a little after 11 p.m. But wait a minute...what's that with Loretta??? OMG! She's got two lambs and they're both white! 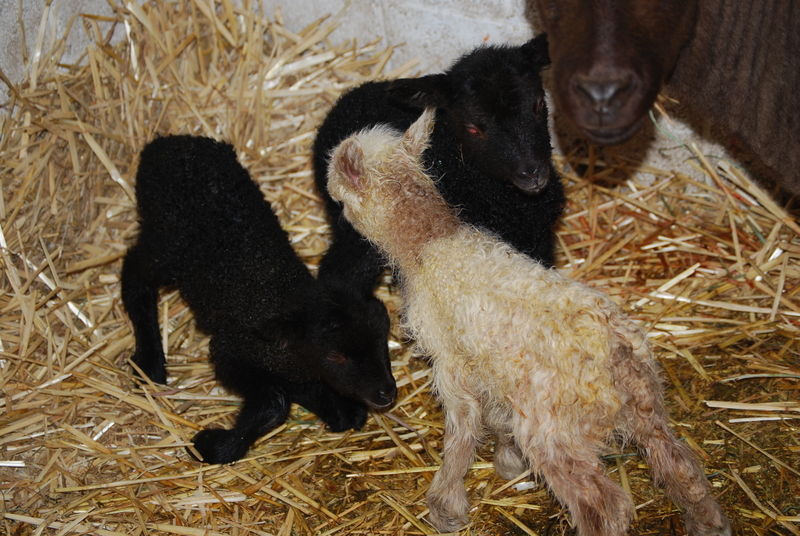 Loretta is a iset (forsted looking) black Shetland ewe so having white lambs was astounding to me. (They are actually very, very light gray). Twins again and one of each, a ram and a ewe lamb. Things settled down quite a bit but I did notice that our last ewe to lamb, Ailee, was starting to act as if she was going into labor. Oh, great! Geez-Louise! But Ailee never progressed along as she should have. The next day I had Rob, Sheep-Vet-Par-Excel-lance, come out to check poor Ailee. Yes, she was in labor. No, she isn't progressing. Let's try some calcium gluconate and oxytocin to speed things up a bit. Nothing. She went on all day in fits of activity as if she was going to lamb any minute, then nothing for hours. Melanie had come back later Friday to see how Ailee was doing and if I needed any help. By now it was past midnight and into Saturday morning. I gloved up and :went in" finding that Ailee's cervix not dilated at all but a lamb's head behind the membranes just wanting out. I called Rob from the barn. After telling apprising him of the situation, he decided she should come in to the clinic. He'd meet us there. If we let it go longer we'd lose her and the lambs as well. She needed a c-section. So, my DH, Ralph, got the truck ready and we hefted Ailee the Rotund into the back of the truck. At Rob's office, he too did an exam showing how tight the cervix was. He tried to open the cervix. Nothing. Before we knew it Ailee was shaved and prepped for surgery. Ralph passed the gas as Rob had shown him...Rob opened Ailee's side...and then Rob dropped a huge lamb in the towel I had waiting in my arms. "I think this one's dead. ", he said to me. I took the lamb, toweled it off and suctioned the fluids out of the mouth and nose. And it was alive! A beautiful spotted lamb! And it was a girl!!! Rob called me back saying to bring a towel...that he'd found a second lamb. 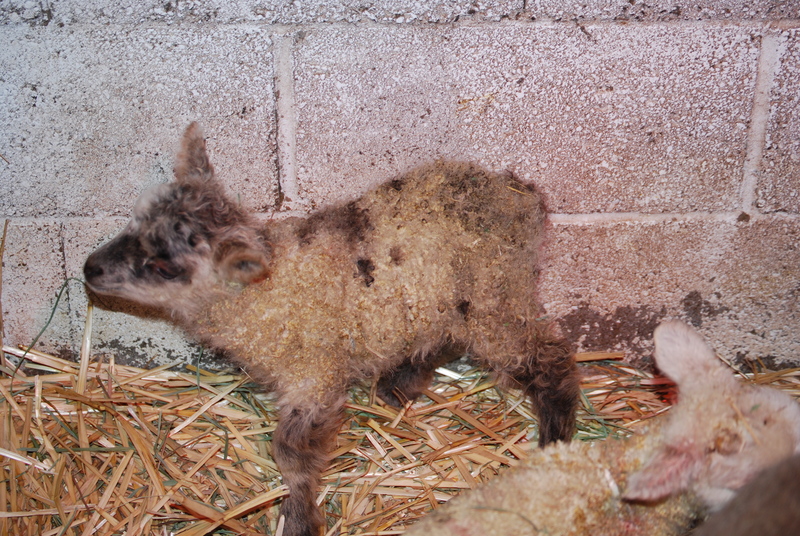 Soon I had another lamb to care for - and it was another ewe lamb as well. As he was closing her incision, Rob said he thought this should be it for Ailee - and that she never would have been able to deliver those huge lambs in any normal way. The next pregnancy could kill her. I don't have pictures yet of Loretta's lambs or Ailee's two girls. As Ailee was out of it for most of the bonding time she really needed to have, we fed the lambs colostrum and dried them off. So far, she's bonded with the second ewe lamb, a lamb born brown but with a definite gray underneath that coat of brown. But she hasn't bonded well with the first. As of this writing, Ailee continues to push the spotted lamb away from her and refuses to let her nurse. So, I step in. Ailee still sleeps with the lambs and does some other motherly actions, but it's clear - "I like this one, not that one!" I bottle feed the spotted lamb I have taken to calling "Sugar". The jury is out, though, on whether or not Ailee will take on her full duties. In any case, it's become clear that Ailee should be going to a new home as soon as she weans these girls. And isn't it the way that she's got some of the best fleece in the flock? But Rob and I agreed. No more lambs for Ailee, ever. She needs to be in a flock without any chance of becoming bred. She's had two pregnancies with problems both times. Sorry, Ailee...it's a spinner's flock for you. So...for the ending totals we have the following: 7 ewe lambs, 2 ram lambs! Not bad, Loki. Not bad at all. Ya done good, kid! 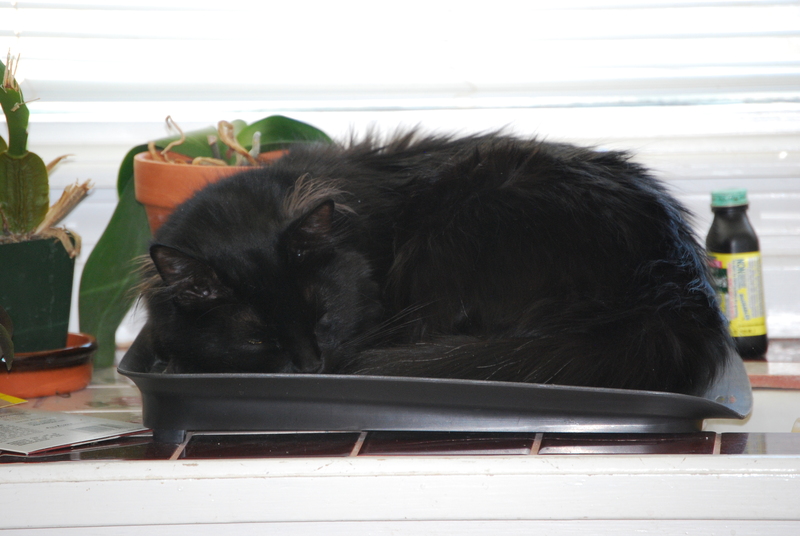 *Note: Today is the birthday of Miss Sinda, the Cat, who shares her life with my friend, Tina. She turned 20 today! Not bad, Sinda...not bad at all. :) Please stop by her home at Marietta Shetlands and wish her a Happy Birthday. Today should be the start of lambing season for Sheep Thrills Farm. The girls are uber-pregnant right now, with two showing signs that labor may be beginning soon. The first photo below is one I took about a month ago, right after shearing. It was obvious then the girls were all "with lamb". Loki did manage to figure out what breeding season was all about. I am really looking forward to seeing what we get with this breeding from Loki. When I was researching his pedigree I noticed all his sire's first generation (called F1 generation when using artificial breeding) were white, but when I looked farther into the F2 generations offspring, all sorts of colors and spotting showed up. I know Loki carries spotting as he does have a mottled nose of black and pink as well as some sports, although small, on his face and ears. I am really hoping for a multitude of colors this year. That said I also realize Mother Nature has the final word no matter how I plot and plan. Ewes live to be moms. They excel at mothering above any other creature I've known, humans too. They're OK with skipping a year, but give them the choice and they'd have litters of babies if they could. (Not unlike the Finn-sheep who do have litters) I can see in the girls' eyes that while they are at the very uncomfortable stage, each one is hoping for lambs to mother. I have to be on my toes that one ewe won't steal another's lambs, which has been known to happen. They just love those babies! As soon as we get some lambs I will post a few "baby" pictures. The lambs haven't even hit the ground and I ready for lambing to be over with. As I wasn't sure if Loki could handle the job (I've always used full-grown rams before), and with the stress of the dog mauling attack in February, I wasn't sure we'd have any lambs here at all. But where there's a will, there's a way - and Loki most definitely found "the way". Rascal, on the other hand...could care less about lambs and more about sunshine.